In a nutshell, we recommend XL for full frame lenses and ULTRA for DX/APS-C lenses. For the long story, read the 'limitations' column. Supports 4k video mode with DX lenses (except on GH5). New positive-lock EF lens mount. Detachable tripod foot compatible with Arca Swiss, Markins and Photo Clam ball heads. Rubber gasket protects MTF mount connection from dust and moisture. The opening is flocked with felt material to reduce internal reflection. EF-S and third party DX lenses do not cover the full Micro Four Thirds sensor in still photo and FHD video (but will cover 4k video mode on GH4, GX8 and GX80/85). AF may not work if the maximum aperture of the lens plus any EF Extender or other teleconverter attached is smaller than f/8 before boost or smaller than f/5.1 after boost. AFC (continuous AF) and AFF (flexible AF) modes are not supported, except on Olympus OM-D E-M1. Panasonic video AF may hunt more than a native lens or have unsatisfactory performance. Some Tamron lenses may have unsatisfactory AF accuracy. No support for Focus Stacking and Focus Bracketing on Olympus. On Olympus, other than E-M1, you may move the single AF point among any of the 81, but you may not multi-point AF. There is no restriction on E-M1 and Panasonic. Very early Olympus models (e.g. E-PL1) have no autofocus support. EF-mount lenses are not silent but may make audible click noises during autofocus operation and iris changes which may be picked up by the built-in microphone of the camera. An external microphone is recommended for video. Use of Canon Cinema lenses such as CN-E 18-80mm T4.4 L KAS S for still photography is not supported. Iris changes are in 1/8 stop steps which may be noticeable in video recordings. Programmed exposure mode and shutter priority exposure mode should not be used for video. This limitation does not apply to Cinema EOS lenses which permit fine resolution iris control, such as CN-E 18-80mm T4.4 L IS KAS S.
A new Micro-4/3 mount Speed Booster® adapter designed exclusively for the Panasonic GH4 and other selected Micro Four Thirds cameras (refer to the below camera compatibility table), with a magnification of 0.64x. The Speed Booster XL 0.64x uses an advanced 6-element optical design to achieve extraordinary optical performance at apertures up to an incredible f/0.80, a new record for Micro Four Thirds format. The working distance has increased by 1mm to permit use on the Panasonic GH4 and a number of other Micro Four Thirds cameras without touching the flexible outer cover of the camera’s shutter mechanism. The optics are optimized for a standard Micro Four Thirds filter stack thickness of 4mm rather than the 2.4mm found in Blackmagic cameras. The image circle diameter has been increased to 21.63mm so that the full 17.3mm x 13mm Four Thirds format is covered. This has been achieved while maintaining unusually high image quality over the 17.4mm image circle used by the Panasonic GH4 in its Cinema 4k video mode. Although the Speed Booster XL 0.64x has extra clearance compared to the 0.64x BMCC Speed Booster, there are still a number of Micro Four Thirds cameras that are not supported due to mechanical clearance issues. This is summarized in the table below, which is color-coded so that Green means the camera is supported and Red means the camera is not supported. Note that many of the Red-coded cameras actually do function, but there is a minor interference with the protective shutter cover. Although slight contact with the shutter cover appears to have no effect on the functioning or cosmetics of either the camera or the Speed Booster we cannot support these combinations due to possible risk of damage. 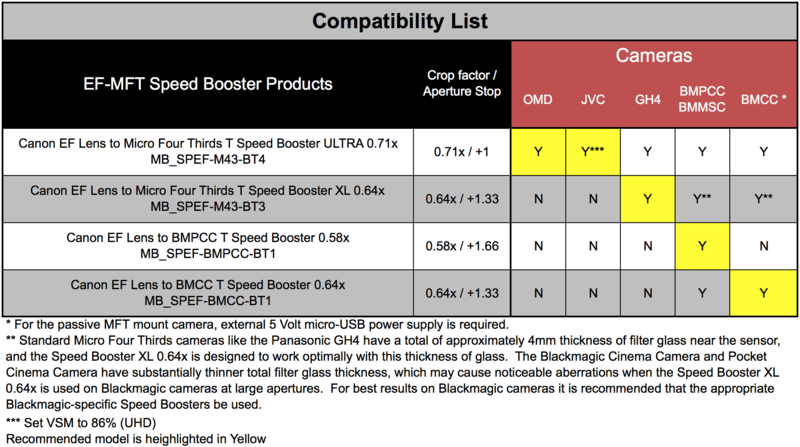 New in Speed Booster XL for Canon EF Mount to Micro Four Thirds is autofocus support, subject to certain limitations (see table above for details). We are pleased to report that Panasonic Micro Four Thirds camera bodies are capable of autofocusing accurately even if the maximum aperture of the Speed Booster and the lens combined is in the sub-f/1.0 range. Although our first and foremost priority is accuracy, we are able to make great strides in autofocus speed as well. The following table lists lenses which has been tested. Other lenses not listed here typically works well, too. Tested by the community, thanks! Some improperly-made M42 screw mount adapters may short the electronic contacts of the Speed Booster and cause damage to the Speed Booster and/or camera body. Focus confirmation "chips" such as Dandelion are incompatible. Many manual focus lenses (e.g. OM 28/2.8, OM 50/1.8, Leica R 15/3.5) have rear protrusions (spikes, levers, other appendages) which would damage the optics and/or housing of Speed Booster. They need to be modified before they can be safely used on Speed Booster. Check and make sure there are no rear protrusions from the adapter/lens combination before using on Speed Booster. Scratches and damages caused by rear protrusions on Speed Booster are not covered by warranty. Every Pentax K-mount lens has a protruding fin and an aperture lever. It does NOT fit. Remark: Your PayPal receipt is your order confirmation. There is no separate email confirmation until shipment takes place. Disclaimer: we are NOT licensed, approved or endorsed by Micro Four Thirds or Canon. Since its inception, Metabones has been designing and manufacturing lens adapters recognized among professionals and enthusiasts as leaders in design and workmanship. Contrary to the popular trend of other factories using an aluminum ring painted black on the camera-body-side, we instead take no short-cut but use precision-machined brass with chromium plating on both the camera-body and the lens sides of our adapters, in order to ensure smooth mounting, great appearance, and durability. The lens side of the adapter features a strong leaf-spring structure, strengthening the adapter-lens connection and ensuring tightness of the lens in order to reduce wear and prevent focus errors and optical alignment issues from appearing. Metabones uses matte-black treatment to keep internal reflection to a minimum in order to maintain the maximum optical quality possible with the lens. All Metabones Adapters follow this tradition of uncompromising precision, robust build quality and outstanding finish. Our new Smart AdapterTM series of products add industry-leading electronic interfacing technology from Canada, with true electronic control of the lens' aperture directly from the camera body. Both camera-side and lens-side of the adapter are made of brass, precision-machined and plated with chromium. Satin surface finish - just like your OEM lens and camera mounts. Precise fit and solid connection - lens has no play, gap or wiggling when mounted on adapter and no adjustments are required to fit your lens. Designed to reach infinity focus while maintaining the correct registration distance required to maintain optical quality of CRC lenses or lenses with floating elements. True electronic integration of aperture diaphragm - let camera automatically choose aperture in P or S exposure modes, or dial in yourself on the camera body in A or M modes. EXIF data such as lens identification, focal length and aperture. Copyright @ 2012-2018 Metabones. all rights reserved. All trademarks referened herein are the properties of their respecitive owners.